First day of school and the first signs of things returning to 'normal' since May! 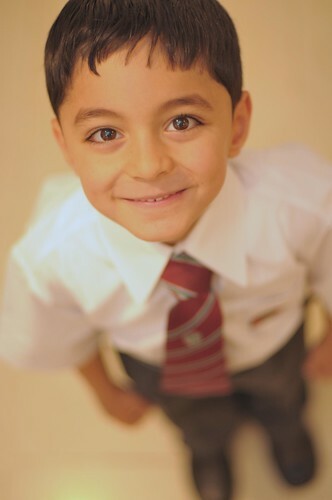 The photo above is of Yousef taken earlier this morning. Hope the kids have a wonderful year at school! We (and by we I mean my wife!) have been preparing him positively. Nice shot! Love the DOF in this one? What is the aperture for this, if you don't mind my asking? My kids been OK with going to school the last couple of days....scares the hell out of me...!! :) hope it stays that way. Its that million dollar smile that makes you want to start the day! So how is Yousef doing? Does he like his teacher? My son - almost his entire school career - when I would ask what he liked about school, would answer "lunch" or "recess" or "the last school bell." When he was leaving university he looked at me and said "I know how to be a good student - what I don't know how to do is be a grown-up!" I laughed at the change. He hated school; he loved university, where he could make his own choices.